ESPN's Rick Rick Reilly has a funny piece this week about steroids and their impact on recent MVP awards. One of the players he calls out is Seattle's own Adrian Beltre. "I have a U-Haul of hardware here for Jose Alberto Pujols Alcántara of the St. Louis Cardinals. You already have two MVPs, Albert, and you're about to get three more, since Barry Bonds ripped you off worse than Bernie Madoff to win the award from 2002 to 2004. You hit .335 and averaged 41 bombs those years and yet you finished second behind the clearly creaming Bonds in '02 and '03, and third behind Bonds and Adrian Beltre in '04. We're throwing out Beltre since, while he denies ever using PEDs, he fell off the face of the planet once baseball put in stricter steroid suspensions in 2005. If he wasn't cheating, I'm the Queen Mother." 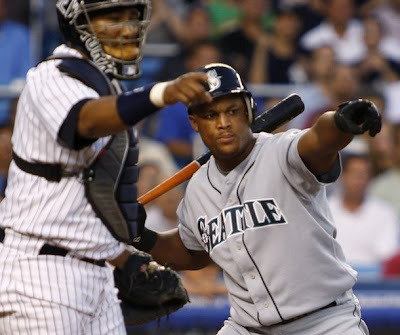 On a side note, Beltre is seen here appealing his own check swing, which he does frequently. Nothing funnier than watching Beltre ask the 1b umpire to ring him up after the home plate umpire doesn't call a strike. Why doesn't someone with the Mariners explain to him that he is the only major league hitter (ever?) to do this and that it can only hurt him? Back to the 'Roids. Beltre can prove in 2009 that he is not a cheater, and that he saves his best effort for contract years. Hit 35+ HR this year Adrian and we'll know you play for the cash and not on the juice! The deal is done...finally! Griffey winds up with a $2 million contract that can balloon up to $4.5 million with incentives. The public relations benefits of bringing Griffey back are obvious for a team with plunging attendance. What isn't quite as obvious to many is the actual value Junior may bring to the team. While his batting average is not going to be pretty, the key stats to watch are OPS (OBP + SLG), HR & RBI. He produced a .777 OPS in 2008 and .868 in 2007. 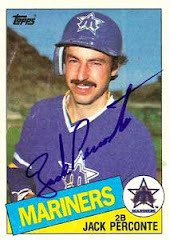 Keep in mind the Mariners had only ONE player with an OPS over .800 last season, and he left in free agency (Ibanez). So by splitting the difference between his 2007 & 2008, Griffey could have an OPS over .820 and be the M's most productive hitter at a bargain basement price. For some reason is it very difficult to score when you don't have any power hitters and nobody gets on base. Only TWO Mariner regulars had an OBP over .327 last year (Ichiro & Ibanez). Griffey has done that every year except for 2006 (his OPS was still over .800 that season). Griffey won't make the M's a contender in the AL West, but he will make things more entertaining and hopefully will keep the M's offense watchable. Mariner fans deserved a feel good story. With the Mariner deal nearing completion, Ken Griffey's agent earned his paycheck by getting another player in the ring. Reports keep mentioning Atlanta's proximity to Griffey's home as a major selling point. Sound familiar? What is it with Griffey's need to be close to home? He's on the road all summer anyway. I think he has enough cash to get a sweet pad for his family in Seattle during the summer. My prediction is that the Atlanta involvement won't change Griffey's date with destiny here in Seattle. But it may result in some sort of 2nd year with a club buyout. Cincinnati Reds team physician Tim Kremchek doesn't believe passing a physical will be problem for the oft-injured outfielder, who turned 39 in November. "I can't imagine any problem," Kremchek said by phone from Cincinnati. "I've known Junior 10 years. I've operated on his right shoulder, his wrist, his right knee, left knee, his foot and hamstring." What do you want to bet Kremchek owns a Land Rover and despite the fact that his mechanic sees it more than he gets to drive it himself, he thinks it's the "best car he's ever owned." Well almost. Looks like the M's are about to make the 2nd best AL West free agent OF deal of the week. He's no Abreu, but the good news is that Griffey has demanded that Pokey Reese come to Seattle with him in a package deal. His dad says Pokey is the key to a championship. One thing is certain, it should spice up a spring training otherwise dominated by such riveting questions as: Johjima or Clement? Branyan or Shelton/LaHair? Chavez or Balentin or Morse? Silva or Rowland-Smith?